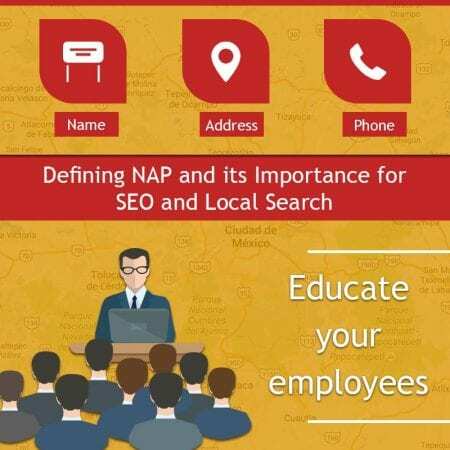 There are many acronyms used in the field of digital marketing with NAP (Name, Address, Phone number) being one of them. This is a simple way of referencing your business’ name and contact information as it appears on any website referencing you. It’s important that you don’t overlook this part of your SEO if you’re concerned with ranking well organically. It makes you appear in geo-targeted searches. When it isn’t included on your website and social media profiles the search engines won’t know how to provide the correct contact information to someone who conducts a local search for your products or services. When used consistently it verifies your legitimacy. This is because many search engines will cross reference it to validate that you really are who you say you are. While this doesn’t give you any priority in the search engines themselves, it does help ensure that your business ranks well. Determine the best way of representing your company’s name online. This should be its full name, not a nickname. Determine the best way of writing your company’s address. Even subtle differences (e.g. road vs. rd.) can make your NAP look inconsistent and illegitimate. Determine the best way of formatting your company’s phone number. Educate your employees about how important it is to always remain consistent here. Many of them don’t realize that this can hamper your SEO efforts – if they even understand what those efforts are or why they’re important in the first place. Create a branding bible and place the exact NAP you want your employees to always use therein. This will teach your employees to always do the same thing every time, which is important because search engines think and act like people – they’re also easily confused just like people. Make sure you have one employee who’s responsible for always searching the internet to make sure your NAP remains accurate – include the various websites and social media profiles your business also owns. Make sure it’s included in all your social media profiles. Once you’ve done all these things you must also make sure you check these citations occasionally to make sure they remain accurate. Even though this is a big job, it’s an important one so you may want to hire ISEOU to handle it for you. This is something they’ve managed successfully for many clients and look forward to doing for you as well.